– Sometimes you have to kill your babies. No real ones of course but ideas and concepts that don’t work. Here the sad story about a concept we had to kill. Electro magnetic manipulation (this includes a bit more than just magnetism). A storyline concerning recent activities. Characters made out of electric parts. 2 players enhancing/helping each other. Communication with NPC through electromagnetic bursts. Steam punk / tech style (like Machinarium, but different). Storyline based loosely on epic concept of the heroes journey. At the end we had a nice game idea with a bit of everything but maybe therefore generic and without fun. We threw out everything and started new. Reviewing the old pitches in search for something good, we noticed something in the “Bomb and Fuse” idea: there was a big artefact in the background, a big robot. And then we asked why not the robot is the stage instead of just a decorative goal? And why not destroy the world instead of save it? Why not making the game a bit faster and with more action? 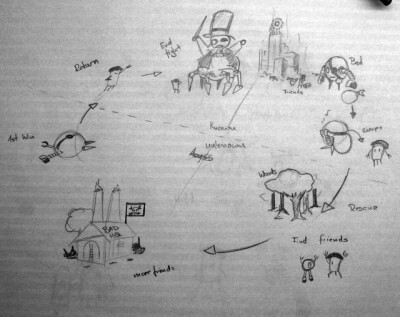 We were excited with this new idea but we were still missing a higher concept like the one we had in “Tales of Archy”. But this is long enough! Next post we’ll talk about that. 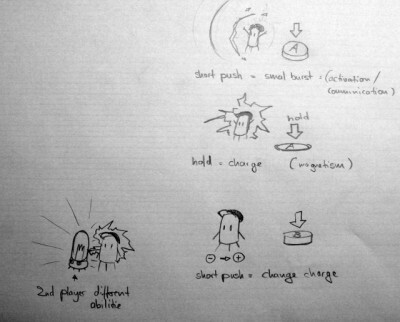 Tagged concept, dead end, design, fails, game, game ideas, rebirth, redesign.